This is the best eye cream that I have ever used and I have tried a lot of different eye creams over the years! I can see my wrinkles become less visible since I have been using this amazing eye cream the best part is I have only been using it for 2 months!! 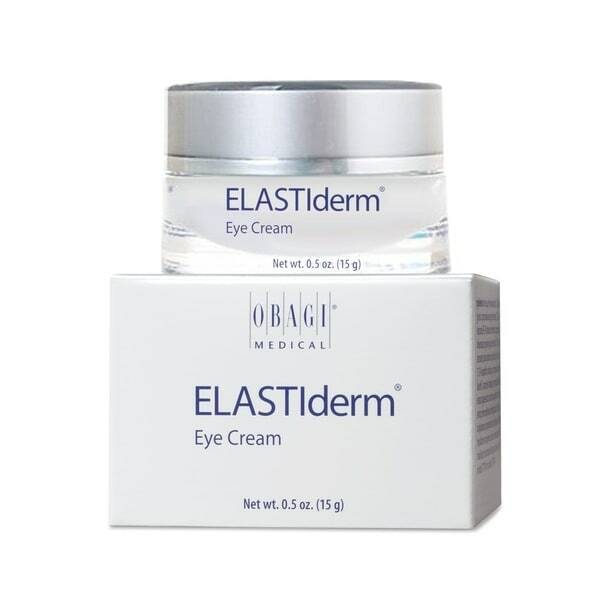 Treat that delicate skin around your eyes correctly with this restorative ELASTIderm eye cream from Obagi. Formulated to replenish elasticity and build collagen for better-looking skin in just 14 days, this oil-free preparation features a unique restorative elasticity complex that is clinically proven to firm skin and improve resilience. On Obagi's actual website is lists Overstock as one of the unauthorized resellers (meaning it cannot guarantee the authenticity if sold via a list of the retailers and not in doctor's offices). I originally purchased this product through my dermatologists but I don't have the same derm now because I moved, but I still have that original jar I purchased from them, it's an expensive product. I then found this 'deal' through Overstock and thought I would buy as Overstock itself seems reputable and I have purchased from Overstock on other items before. As I continued to investigate online, I seriously can't figure out if what I have is a fake or not. Obagi themselves said it could also be an expired or close to expired batch (not necessarily a knock off). But their website is so cryptic you can't tell what lot numbers mean and they offer no logical bar coding info system either to give a person a clue. The new and old bottles do look similar. Even with lot numbers stamped at the bottom.There is a registration trademark on both the new box and bottles (I was told if doesn't have one it's a knock off, but knock offs are so good these days they can have that too and still be fakes). I smelled it and seemed like it's the same as my other Obagi product I have that I know is authentic Obagi (because it came from my derm). I give it 4 stars for this reason. I will continue to use the product and see if it helps me and I will post an update. I'm actually thinking it's authentic because I see it's made here in California (not over sees), but again, very very hard to tell. Don't buy through Overstock. I made the mistake and received counterfeit product which cause a skin reaction (and I have been using the line for years). My fault--I should have known the price was too good. To top it off, Overstock would not accept a return or offer a refund. Unacceptable. My dermatologist suggested I use this product and recommended I buy it on Overstock. I have very dry skin and always need to moisturize mid-day, making it difficult to wear makeup as you need to re-apply. My dermatologist also said as I was nearing 40 years old, my skin is starting to slow down collagen production making my skins elasticity less viable. This product help alleviate that problem. Prior to this product I would be able to see lines by mid-day when my skin was parched & dried out. I have been using this product for several YEARS and I love it. You just need to dab a small amount which makes it last a long time. It’s well worth the price. Ibrahim has been a highly respectable & recommended product line by high end dermatologists. Even several years later, my dermatologist recommends this product. I now also get laser hair removal done at a skin spa (not related to my dermatologist) and they carry all the Obagi line as well. That tells you something. My dermatologist recommended this product several months ago and I've been using it since. It has really helped with elasticity around my eyes and doesn't cause morning puffiness (I'm 44). This is the only eye cream I've used that reduces the appearance of fine lines around my eyes. I love and recommend this product! Not sure if it works or not but this is a highly recommended cream by my skin care provider and the price was very acceptable for this brand. The is my second time purchasing this eye cream. I did notice an improvement to my upper eye lid .. more firm. I do not use any other obagi products .. but would recommend this eye cream .. This eye cream provided immediate results the first time I used it = it erased my dark circles and smoothed out crapey lids. I love the texture - it is thin, a little watery, and is so easy to smooth around the eye countours without pulling and tugging (a la the thicker creams). The scent (if any) is pleasant, light and extremely faint, and appears to be from ingredients rather than perfumes. This cream SOAKS IN immediately, unlie most, and therefore I find I can always wear it during the day under eye makeup (I can't do this with most eye creams, as my lids are oily and makeup slides right off). I have to admit that I love Obagi skincare, but I didn't think they were "luxe" enough for me in the eye cream department. I stand corrected, and I will use this stuff for life! YouTube Wayne Goss did a very positive review that convinced me to try it - he is right about everything. I am converted to this wonder cream, and at 50 I really needed the real deal. If you have fine lines, dark circles, and a sagging lid, you NEED this cream - it makes a real difference!!!!!!!! It is AMAZING. Gorgeous eye care product! Its light texture is what the delicate skin around the eyes need. Highly recommend! The product works well and the first jar I purchased at the dermo office lasted for 4 1/2 months. I notice a significant improvement. I have used this eye cream for years. It has kept my dark circles at bay, smoothed my under eye area, and helped with my crow's feet. i highly recommend it. Great price too. I have been using this for 2 years. The results were amazing. Because of this product, I started using the whole obagi line. I love it!!!!! I love this product and saved a lot buying it here. My favorite under eye cream. This product is light and refreshing. I like it for daytime use but would prefer a thicker cream for night time. The jar doesn’t hold much product. I will probably try another Obagi eye cream next time to compare. Love this eye cream and the price was best part. "how do i know if this product is a counterfeit? Several buyers thought it was." Appeared to be the real thing. Mine was fine, just as it should be. appears to be the real thing? I believe representatives from Overstock should be able to answer that? If not an Obagi product then I would think that would be a problem for them. It is as effective as ones I have purchased from the dermatologist? "what is expiration date on this product"
I purchased a year ago and dont have the product anymore. I purchased about 1 month ago, it seems authentic. I compared to my Obagi from MD and neither had an exp. date. they had batch numbers, but I am not able to tell the age from that. I don't detect anything amiss with it and am buying more. I too wondered about this and thought I would take the chance. Obagi would not answer as to how Overstock gets this. They say they are not direct sellers, I imagine they are "overstocks" that Obagi is offloading at a discount, but they still want to protect the MDs who sell it directly. Hope that helps. "My eye cream is not authentic, it is cracking all of the containers plus my own. I would like to be refunded if you truly stand behind your sale of these Obagi products. Authenticity is necessary for you as a seller. I re-purchased from authorized dealer and the consistency of the items is definitely different. What will you do?" "So, its an eye creme you recommend NOT using on eyelids. So, its not an eye creme? I'm confused." I have been using this eye cream on my eyelids for years. I also put it around my eyes. I use mine under my eyes, then at the outer corners (where crow's feet would be! ), then I finish in the creases of the eyes. I do not use directly on my eyelids only because I don't want to get it in my eyes. But I don't see why you couldn't put it on your eyelids if you wanted to. Eye creams are meant to be used under and around the eyes but not on the eyelids. I work in a skincare office and most of our products are meant to be is this way. The tissue of your eye lid won't respond like the tissue around the eye. "Does this Obagi product have expiration date and product code number on it?" This Obagi product is the genuine product and will include the original packaging and prints on the container. "is that a real thing ?" Hello girl, yes, this is real eye cream. Sorry for any confusion. Thank you for shopping with us! Yes, I really wanted this cream as I am always looking for products that assist/help with the eye area. Go to YouTube and view the makeup artist, Wayne Goss' video (British gent). He is the one that told me about this cream. I took it a step further & got the gel also. I use the cream in the evening & the gel in the morning and I have noticed a BIG difference in a short time period. You will not be disappointed & check the Obagi site and see how much you will save w/Overstock! I am thrilled. "Is it safe to use on eyelids?" Hello lizaf115, it is recommended to avoid the eye area. Please let us know if you have additional questions. Thanks for shopping with us. Yes.....it is safe for the eyelids. After having eyelid surgery, this product was recommended for use on the eyelid and under the eye ...by my surgeon. It builds up the collagen and reduces sagging and lines. do not put on eyelids. also, when you use your other skin care, do not get any in the area where you apply this cream. this cream is meant to be used by itself & the other products may cause this product to lose its effectiveness.